Their difference from other workout routines? Craig Ramsay and Pandora Boxx are making a fun-filled, LGBT-themed fitness program. Craig is a health expert and fitness coach; formerly he was a ballet dancer, hockey player, and contortionist. He has quickly become one of the most sought after fitness gurus in the world. Pandora Boxx is a drag queen, actor, comedian, and writer. She was one of the most popular contestants on the hit show RuPaul’s Drag Race (Season 2 and All Stars). Pandora didn’t win but proved to be a huge star nonetheless, winning “America’s Next Drag Superstar” from Entertainment Weekly. She has appeared in numerous things since then, such as shows, off-Broadway comedies, and a video game. Pandora was the creator, writer, and star of the play “The Lipstick Massacre,” and premiered to sold out shows. When the two came together for some training, they realized that they had great chemistry and they were enjoying their workouts so much more. Pandora admits that workouts are a drag normally and that it was important to put some fun into fitness. The Kickstarter is needed to get the money raised to produce the show. 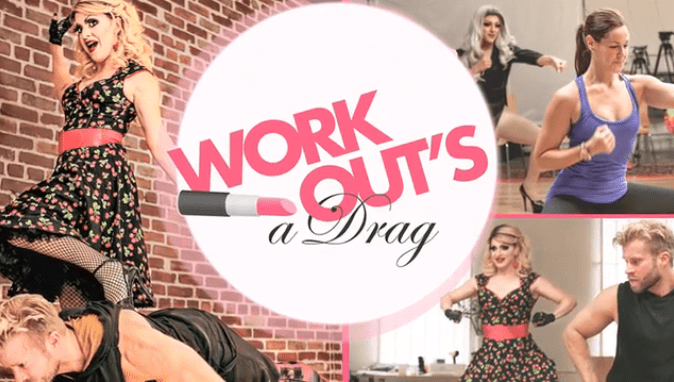 Their intro video states that the workout will be for “women, drag queens, and trans….and everyone else who is fabulous!” The sneak peek video shows various drag queens auditioning for the workout DVD in their full outfits and high heels. It’s super impressive to see them doing kicks in 6-inch heels. All in all, I’m excited to be able to try a workout routine with a comedic element to it to break the cycle of dragging workouts currently on the market. Additionally, it’s amazing to see an LGBT element entered into the fitness world.